Prilled calcium phosphate with molasses binder. Phosphate is an important micronutrient. 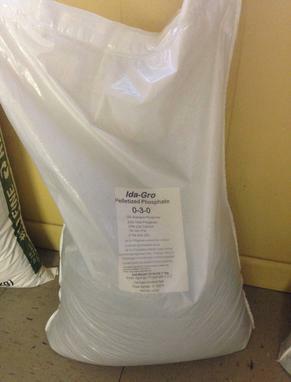 Ida Gro Phosphate is recommended for soil or plant phosphate deficiency. Phosphate (P2O5) is one of the major macronutrients along with Nitrogen (N), and Potash (K2O). It is difficult to measure soil availability of phosphate and some soils may need large initial applications (up to 1000 lbs/acre) to bring the soil to a point where it will release sufficient phosphate to the plant. After the soil is brought to balance, only maintenance amounts (100-200 lbs/acre) are usually needed. On the other hand, very little phosphate is leached out of the soil, so over-application can also occur. Nitrogen and Potash are much more mobile in the soil than Phosphate. When manure or compost is applied in sufficient amounts for the crop needs of N and K2O, phosphate will build up over time, as N and K2O are used and/or leached out of the root zone. This is something that organic farmers should be aware may happening to their soil. It usually takes 5-10 years for phosphate levels to build up to a point where they can interfere with the uptake of other minerals. At some point it will be best practice for organic farmers who use manure or compost to find supplemental sources of N and K2O to avoid phosphate buildup.